The Penguin City Slot is a five reels slot with 4096 ways to win. The slot which comes from Yggdrasil Gaming is it’s all about the Penguins who want to escape from Penguin City. The game is available on all devices including Smart Phones, Tablets and Desktop. The minimum bet is 10p and up to £125 you bet for a single spin. Furthermore, the Penguin City Slot has some very noteworthy bonus features. There is the Penguin Escape Mode feature and the Emperor Penguin feature. Both features are visually fantastic and not only give you good winnings, but also lots of fun. 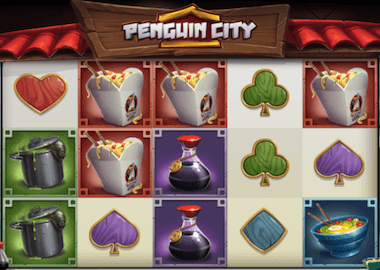 Symbols and Payouts: The symbols of Penguin City Slots consist of low paying cards symbols and theme related high paying symbols. Clubs, Spades, Hearts or Diamonds are the low payer. The heart symbol is the most valuable and pays you 5 identical symbols to 5 reels 70x your bet. The other symbols are all sorts of kitchen items: fish broth pots, kitchen cleavers, soup bowls, dark soy sauce bottles and noodle boxes. The top symbol is the noodle box which pays you up to 250x your bet. There is also a Wild Symbol and an Emporer Wild. Penguin Escape Mode feature: The Penguin Escape Mode feature triggers in conjunction with a wild symbol. When you land a winning combination involving a wild symbol in the base game, you will activate this feature. When the feature runs, trying to escape a penguin with each spin. You will then receive a Sticky Wild symbol on reels 2 or 4 if you have a winning combination. The second possibility is that you get a Wild symbol on reel 3. You play this feature in the form of re-spins until you get no winning combination. Emperor Penguin feature: The next very successful bonus feature of the Penguin City Slots is the Emporer Penguin feature. You trigger this feature with the stacked Emperor Stacked wild symbol on the middle reel. With this full reel wild symbol you get a guaranteed profit. The Emporer Wild symbol is also a walking symbol. With each new spin it moves over your reels until it finally disappears and the feature ends. Here are automatically triggered larger profits. Yggdrasil Gaming is a very innovative software developer. The games are always offering new bonus features and are popular with gamers due to their high entertainment level. You can play the Penguin City Slot for free. Click on the slot banner above and the game will open in the new window. Recommendable UK casinos with Yggdrasil Gaming slots can you find in the table below. The Casino Cruise, Spinit Casino or the Casino Joy are top recommendations. Not only can you find all Yggdrasil games there, but you can also redeem a bonus and hundreds of free spins.